Rebels of Tripoli Brigade had been assigned to guard the national museum in Tripoli and other cultural sites. Libya's Islamic Museum which stands in the al Sur area, in Shari’ Sidi Khaliffa, just a few kilometres south of the Medina has been over run by rebels. The former palace was thought to be empty at the time of the incident . The museum was the pet project of Muammar Gaddafi’s second son Siaf. Prior to becoming one of the ringleaders in the regime’s crackdown on rebel forces, calling on Libyans to slaughter the uprising’s “bums, brats, and druggies”, Saif was a cultural ambassador and figurehead of his countries arts program. Saif regularly attended Sotheby’s and Christie’s auctions and was known to be building an Islamic art collection for the new museum, which had been scheduled to open in the capital next month. Now the rebel forces are in talks to turn Saif over to the Hague’s International Criminal Court, when he is found. The Studio Italia Costruzioni had been working flat out for the last three years to complete the renovation of the building. It was set to open its doors to the public, honoring Muammar Gaddafi’s accent to power in September. The original charm of the Museum was maintained by laying a floor of ceramic tiles inspired by the original ones to create giant decorative rugs. The walls were all repainted and the top fascias decorated. The furniture, as well as the original doors and windows, had also been restored. The original colours of the Ottoman Turk courtyard, which were recently hidden beneath layers of paint, had been brought back to life. The new floor with its fountain centre-piece, together with the surrounding blue and yellow-orange motifs, were designed to create a breath-taking open-air room. Saif had been active at the Islamic art auctions at Sotheby's and Christie's, for a number of years, acquiring "mid- low value" items for the museum's new collection. He often used a London-based agent. When some consigners to last October's sales were informed that an unidentified buyer would not be paying, it was widely thought to be Saif. It is not known at this time if looting has taken place at the museum or if any permanent damage occurred, when the building was overrun. Saif al-Islam was Libya's former de facto prime minister, he now faces an ICC arrest warrant and remains at large. There are no further reports outlining the security or fate of the capitol's main museum, known as Tripoli, al-Jamahiri, al-Jamahiriya, or the National Museum, which houses some of the best of Libya's archaeological and historical heritage. The collection includes spectacular examples of Neolithic, prehistoric, Berber, Garamantian, Phoenician, Punic, Greek, Roman, Byzantine, Christian, Islamic and Turkish treasures. In 1982, in a joint venture with the UNISCO, the museum was improved to its current world class status. Another of Libya's important museums, known as The New Museum of Libya, opened in 2010. Reports have yet to surface concerning this institution or the other 17 museums dotted around the country. Hopefully the outcome will be similar to Egypt where the public protected heritage sites, rather than Iraq where wholesale looting took place. It was reported by the Guardian yesterday that members of the rebels’ Tripoli Brigade, made up of city residents and specially trained in Qatar, had been assigned to guard the national museum in Tripoli and other cultural sites. 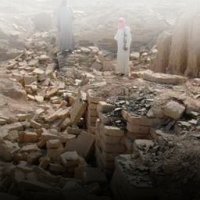 The link to this message http://www.artlyst.com/articles/libyas-islamic-museum-overrun-by-rebels is broken.